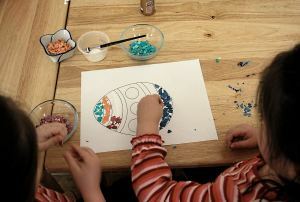 Toddler Activities: Make A Pretty Mosaic with Colored Eggshells. This is a pretty activity for Easter but can be done with any theme or holiday. 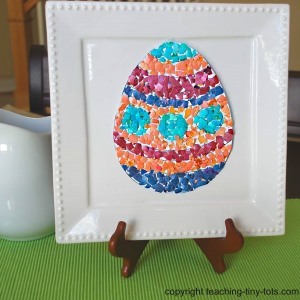 Using brightly colored eggshells, make a beautiful mosaic to celebrate Easter. Make it into a wall hanging or display. It also makes a nice framed picture. This activity is for older toddlers who have some experience with glue and who have the dexterity to peel small stickers and put them on paper. For younger children, crush the eggshells in ziplocks and sprinkle onto glue with adult supervision. Free Printable Egg Pattern Here or draw your own. Eggshells with egg removed. Remove as much of the inner skin as possible. Prepare dye as instructed on food coloring box or an Easter Kit. Most will require vinegar which helps the color to stay. 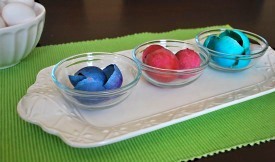 Drop eggshells into dye and stir to get even color. Typically, the longer in the dye the deeper the shade. Remove shells and let dry. Separate shells into containers by color. Break into pieces with spoon or break in a ziplock and pour into dish. Pour glue into small dish or onto paper in a small area and use brush to spread evenly. Spray in well ventilated area with Acrylic Spray. Not required but it really made a difference. The colors became much more vibrant. Save eggshells when you cook scrambled eggs or peel off of boiled eggs. Rinse thoroughly and if possible gently peel inner skin from the shell. You can do this by taking a small piece cracked shell from where you cracked the egg open and pull gently. The membrane should peel off pretty easily. Let dry. Break shells into pieces about a quarter inch width in size if possible. As your child glues it on and presses it onto the paper it may break into smaller pieces which is fine. For four year olds I wasn't worried about letting them overlap pieces. I did try to tell them to put glue the inside of the shell to the paper if they could for larger pieces. For the larger white spaces left, I brushed a small amount of glue and the girls sprinkled like glitter tiny pieces of colored shell to fill gaps. Have your child draw a simple picture or make a easy pattern instead of printing out a picture. 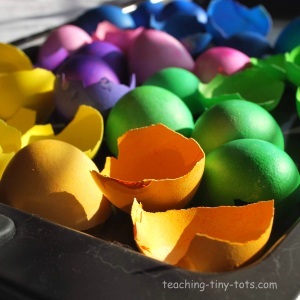 Although this is a older toddler activity, I thought a younger child might be able to do this activity if the eggshells were broken into finer pieces. Providing they understand not to put it in their mouths, they could use a small spoon and using the same technique of applying glue, and sprinkle the eggshells like glitter. I would fill simple shapes or make patterns. Mix the colors together to make a rainbow color and draw basic shapes like circle, heart, square, etc and fill each shape.